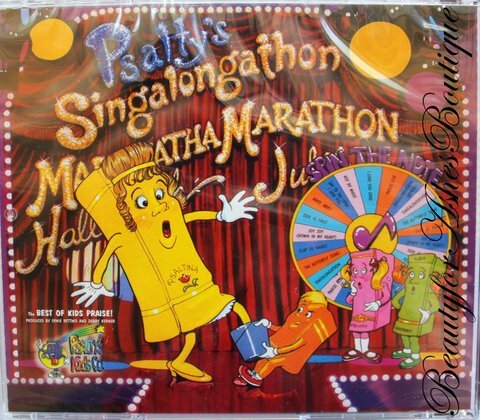 Home > Psalty Kids Store > PSALTY'S SINGALONGATHON CD THE BEST OF KIDS PRAISE! 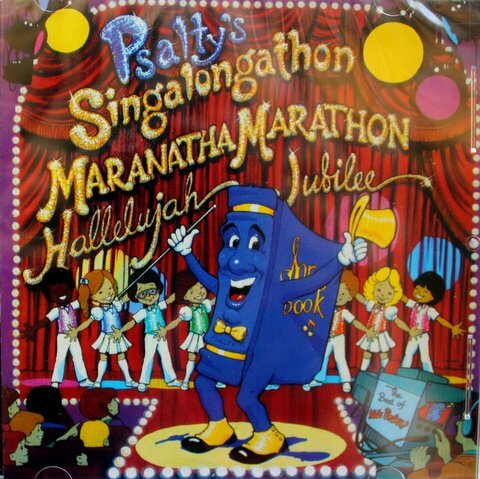 PSALTY'S SINGALONGATHON MARANATHA MARATHON is the BEST of KIDS PRAISE! The kids praise kids organize a Singalongathon with Psalty the singing songbook. God tries to get Psalty's attention during make-up backstage but He doesn't notice. Little Sarah noticed that the show was about to begin and reminds the kids to pray. But the kids are too busy with their own schedules and do not listen. The show now begins and after a couple songs things begin to go wrong. Sarah keeps reminding everyone to pray - but no one seems concerned and time does not permit it. Finally the speakers and everything stop working and Psalty is left crying and wondering why. Psalty asks, "Who pulled the plug?" - NowThe Lord speaks to Psalty about including Him in their Singalongathon - and how they are fighting a battle on their own when its by the Spirit of the Lord that the battle is won. Once Psalty admits that he forgot about God - the Singalongathon continues - this time with things going right. Festive and Fun Praise music for your children or grandchildren! Festive and Fun Praise music for your children or grandchildren! Small spoof stories in between some songs make this CD especially fun for kids. The CD does not state the songs, so we listed to it and listed the songs as we recognize them, hopefully these are the correct titles. Hallelujah Jubilee Music, this CD includes: Hallelujah Joy( Singalongathon Maranatha Marathon), The Butterfly Song (I thank you Father for making me me), Clap de Hands, I've got the Joy Joy Joy Joy down in my Heart, Seek ye First, Arky Arky, Sing to the Lord I Love You, It's Not by Might Nor by Power by My Spirit, I Love You Lord and I Lift my Voice, Reprise of Hallelujah Marathon.